I have never travelled by train in the United States since the time I have been here. All this while, I have always flown in/out of a destination or I have driven or I have taken the bus. So this time around I decided to give the trains in America a chance. In July 2016, I travelled across the USA by train. Traveling from coast to coast in the U.S is considered one of the unique travel experiences in the world. If you were to search for it, I am sure you will find a lot of adventures. One such adventure is this train journey across the country. 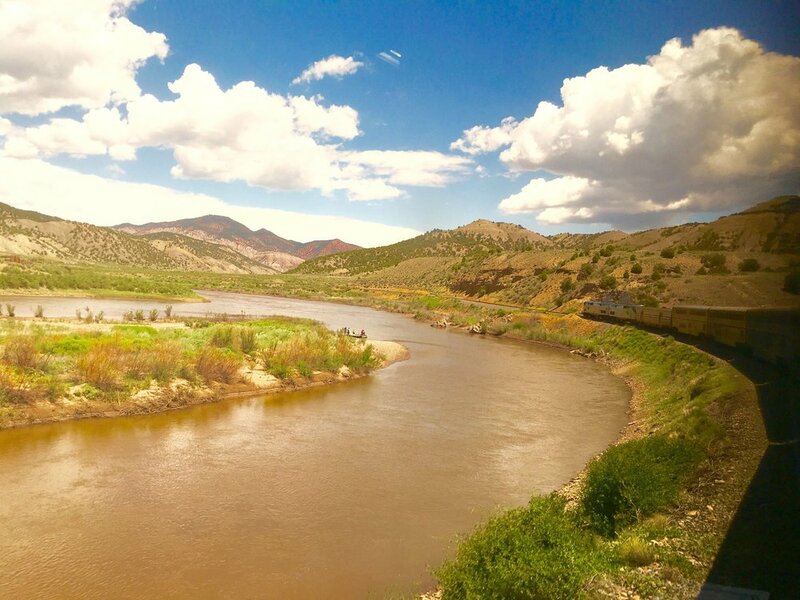 The California Zephyr train from San Fransisco to Chicago provides you one such mind blowing experience. If you were to do this journey without any breaks, then it would take you close to 3 full days. However, you should hop on and off the train to make it more fun. You will have to make separate bookings for each leg of your travel. Third Leg, Denver, CO –> Chicago, IL. I did not take the train for this part because it was mostly through the night and I would have slept through it. I took a flight with Southwest airlines instead as I found a dirt cheap deal for $56. If you do end up taking the train then it would take you 17Hrs. From stunning views of the San Francisco Bay, to the views of higher Sierra Nevada mountains, great desert-scape’s of Nevada, interesting rock formations in Utah, running past the mighty Colorado river and some more gorgeous rock formations. It’s worth every hour you spend traveling on the Zephyr train. Here is a short summary of the train journey in pictures. Waiting in line to board the Zephyr train at Emeryville, CA. I took the coach class and it’s worth the buck. The train begins to cruise, slowly passing by the San Fransisco Bay and making its way through most of Northern California. As the train gains altitude as high as 9000ft above sea level, ears begin to pop. Some stunning views of the valley begins to emerge below. It slowly navigates its way through the Sierra Nevada mountain range passing through many different tunnels making its way via the famous Donner Pass. This is the observation car of the train. You can chill in this car to enjoy the scenery. They have a panoramic windows which provide you beautiful views. There are chairs which face the windows directly and regular tables for larger groups. You can grab your snacks, sip some wine, read a book or even play board games with friends. You also get to meet random cool people here. And then there are sceneries like these somewhere in the middle of the mountains in Colorado. This is the just one of many examples of what you get to see while on this train which is hard to reach via any other form of transportation. So there is that unique factor! There are many more pictures and they still won’t be enough for me to describe how adventurous this whole experience has been for me. But you get the idea! Does this train have WiFi service? No, this train doesn’t provide any WiFi service. I believe in a way this is good, so that you actually enjoy your journey. There is Cellphone reception for most parts, however the data connection is spotty. What is the difference between Coach and Roomette class (sleeper) ? The coach class seats are like the business class seats on airplane’s big, comfortable and semi-reclinable. The food is not included. The Roomette class provides you a private room for two, with beds to sleep and meals included. Are the toilets clean ? Each car has about 3-4 toilets. The toilets are like the one’s on airplanes but a little bigger. They are very clean and its cleaned throughout the journey at every major train station. For those wondering what itinerary I followed during this trip, I have listed below. Please feel free to hack around it and use it like it is below. I totally spent 7 days doing this. I have split the itinerary by the day. I boarded the California Zephyr 6 train from Emeryville, CA. I spent most of the first day in the train enjoying scenery. I arrived at Salt Lake City, Utah next day around 3:00a.m in the morning. Picked up rental car from Salt Lake City Airport, and drove to Grand Teton National Park. The drive was through beautiful state of Idaho. I saw a lot of lush green fields, learnt that Idaho is the potato capital of the world. I then enjoyed stunning mountain-scape’s at Grand Teton, did lots of Hiking, some kayaking in glacial waters, enjoyed the sunset and crashed for the night. I chilled in a little Ski Resort called Grand Targhee Resort for half a day. I began heading back to Salt Lake City do some local sightseeing. Visited The Great Salt Lake and learnt that its the second highest salt concentrated water body in the world after Dead Sea. I ate good dinner and watched a movie to kill time and boarded the Zephyr train to Denver at 3:30a.m in the morning. I got some sleep in the train and woke by 8:00a.m in the morning, ate breakfast and began to enjoy stunning views as the train makes its way to Denver. For the majority part of this journey it races with majestic Colorado river by the side. I waved to random rafters on the river, campers by the river. Reached Denver by 6:30p.m in the evening, rented a car from the airport and crashed for the day. Drove to Rocky Mountain National Park, did lots of hiking, enjoyed stunning alpine views, lots of alpine lakes, beautiful drive up the mountains, wildlife spotting, watched the night sky, milky way and crashed for the night by a beautiful cabin by the Colorado river. Enjoyed the day in a cute little town, Estees Park. Tried the local chocolate(Taffy), ate good food, did some shopping and drove back to Denver. I dropped the rental car and boarded a flight to Chicago. Reached Chicago by midnight, rented a car from the airport and crashed for the night. The only reason I rented a car in Chicago was to keep my stuff in the car while I did touristy stuff in Chicago City. I tasted the famous Chicago Pizza (sucked! ), took the water taxi to Navy Pier, watched the skyline, enjoyed the sunset. I drove back to the airport, dropped the rental car and crashed at the airport until the flight back home to San Jose at 5:00a.m next day.